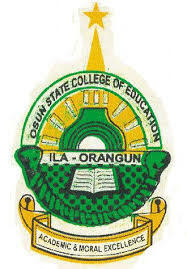 Osun College of Education Ila-Orangun [OSSCEILA] Affiliate to Ekiti State University, EKSU Sandwich Degree [Part-Time] Admission Forms, Courses, Admission Requirements and Application Guidelines for 2018/2019 Academic Session. Interested candidates are invited for admission into the Part-Time Bachelor Degree Programmes of the Ekiti State University (formerly University of Ado-Ekiti), in Affiliation with Osun State College of Education, Ila-Orangun, Osun State. Programmes leading to the award of the following Bachelor Degrees are available. i. Five Credit passes in SSCE (WAEC, NECO and NABTEB) obtained at not more than two sittings. ii. Five credit passes in Teachers Grade II Examination including English Language. Candidates must satisfy the following minimum entry requirements. i. Pass at credit/merit level in two subjects at the NCE with GCE ‘O’ level credits or its equivalent in three subjects, including English Language. A pass at the NCE General English is acceptable in lieu of credit at the SSCE/GCE/O’ level. ii. Two passes at the advanced level GCE with SSCE/GCE O’ level credit passes in three other subjects including English Language. iii. Three passes at the advanced level GCE with SSCE/GCE O’ level credit passes in two other subjects including English Language. i. Payment must be made online via BANKIT(powered by eTranzact) after creating an account and Admission Application forms must be completed and submitted online. ii. Any further information required may be obtained from the Directorate of Continuing Education Programmes, Ekiti State University Or the admission officer (08062574391). iv. NO PHYSICAL FORM IS SOLD ANYWHERE, EVERYTHING IS ONLINE ON WWW.OSSCEILA.EDU.NG . BEWARE OF FRAUDSTERS. BE WARNED.